Tom Hess has taught tens of thousands of music lessons to guitar players all over the world in his online guitar lessons. His live events on guitar playing mastery and music career development are attended by musicians from 39 countries. A few of Tom Hess's noteworthy guitar students can be seen and heard playing on the Student Spotlight page. A lot more of Tom Hess's guitar students can be seen and heard on the online guitar lessons feedback page. In addition to teaching guitar online, Tom Hess has taught private guitar lessons, clinics, workshops and master classes around the United States. He was an instructor at the National Guitar Workshop and has started and directed an electric guitar program at Harper College in Illinois, USA. Tom Hess is also a music career mentor to musicians around the world (up and coming, as well as seasoned pros). Many of the musicians Tom Hess has mentored have toured the world, joined successful bands and built full-time careers playing gigs, working as studio musicians, songwriters, recording engineers, producers and entrepreneurs in the music industry. Tom Hess founded the Elite Guitar Teachers Inner Circle where he coaches guitar teachers on how to teach guitar and develop 6-figure guitar teaching businesses. Many of the guitar teachers Tom Hess has trained have built music schools that earn multiple 6-figures per year, employ multiple teachers and teach hundreds of students every week. Tom Hess's instructional articles are published on dozens of instructional websites around the world. Tom Hess began playing guitar on January 31st, 1986. His early influences included bands such as Def Leppard, Van Halen and Metallica. Later on, after hearing artists such as Yngwie Malmsteen, Jason Becker, George Bellas and Dream Theater, Tom Hess became driven to become the virtuoso guitarist and composer that he is today. This eventually led him to enter music schools and earn 2 music degrees: one in Music Theory and one in Music Composition. Tom Hess also studied with the Lion Music recording artist George Bellas for several years (among other teachers). 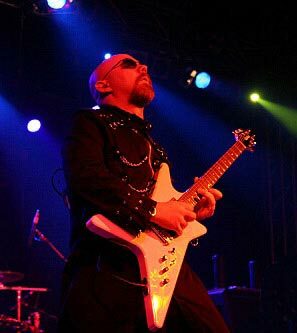 Tom Hess has toured the world in the band HolyHell, playing alongside bands such as Black Sabbath (Heaven and Hell), Motorhead, Nightwish, Epica, Testament, Manowar and Rhapsody of Fire. Tom Hess and HolyHell have performed in front of sold out crowds of tens of thousands of fans including multiple shows in Germany and Czech Republic appearing at the German Earthshaker Fest 2005 and the Czech Masters of Rock Festivals. HolyHell’s debut single “Apocalypse” is clawing its way up the European charts throughout Germany, Austria and Switzerland. In early 2011, Tom Hess joined the epic symphonic metal band Rhapsody Of Fire and recorded the album, "From Chaos To Eternity" that was released on June 17, 2011. Tom Hess is also the main composer of his own instrumental band, HESS. The HESS band releases Opus 1 and Opus 2, have sold successfully in many countries around the world. The album reviews and interviews with Tom Hess and the HESS band are available in the CD reviews and interviews sections of this site. Early musical influences: Def Leppard, Van Halen, Metallica, Iron Maiden, Ozzy, Dio. Later influences: Fryderyk Chopin (1810-1849) Yngwie Malmsteen, Jason Becker, Marty Friedman, Andy LaRocque, Dream Theater, George Bellas, J.S. Bach (1685-1750), Fabio Lione, Paul Gilbert, Mike Walsh, Symphony X, Johannes Brahms (1833-1897), Richard Wagner (1813-1883), Claude Debussy (1826-1918), Gustav Mahler (1860-1911), Henryk Gorecki (b. 1935).